1) Proxy Directive: names a person to make health care decisions when you no longer can. This is sometimes called a "Health Care Proxy" or a "Health Care Power of Attorney." 2) Instruction Directive: expresses your desires/instructions for treatment. This is sometimes called a "Living Will." 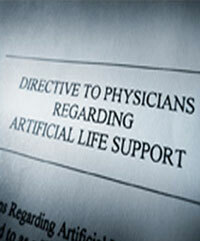 3) Combined Directive: names a proxy and gives instructions for treatment. I have seen too many people pay over $1,000 to prepare these documents. This is simply wrong. These documents are readily available on the web and are easy to understand. In order for the drafting of this document to be effective, however, you must have two formal witnesses. The directive must be in writing. The directive needs to be signed by you. Your signature must be witnessed by two adult (over 18 years of age) witnesses or by a notary public or other legal official (for example, a New Jersey attorney or judge). There is no specific form for an Advance Directive that must be followed in New Jersey, and you don't need a lawyer to prepare one for you. Your directive can be a letter stating your health care wishes or naming the person you trust to make health care decisions for you. If you choose to name a trusted friend as a proxy to make decisions for you when you no longer can, it is very important that you inform them of your decision and that you discuss your desires and values with them. The whole idea of an Advance Directive is to assure that your wishes will be honored. No one can honor your wishes unless they know what they are. Our office never charges more than $250 to prepare this document, and we often do it for free if the person cannot afford to pay this fee. This is one of the most important documents a person can have, especially if they are single or estranged from their parents or blood relatives. To set up a consultation concerning any living will or health care directive, contact us online or call us at (201) 656-1000.